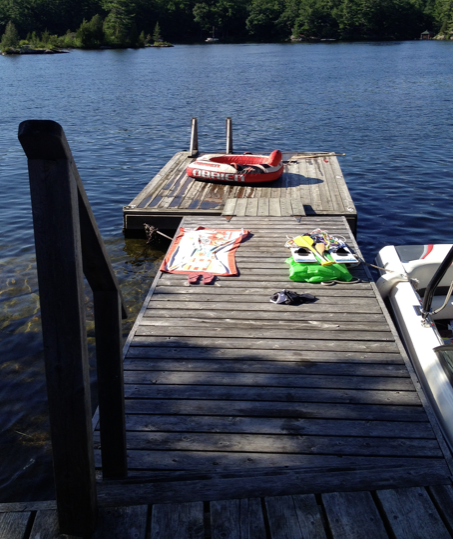 I just returned from a week of vacation on beautiful Stony Lake, north of Peterborough, Ontario. A lot of time was spent sitting on docks (Note: the correct terminology should be Wharf instead of dock i.e. you ‘dock’ at a wharf; however, it is generally more commonplace to use the terminology Dock), at water’s edge. Where there are docks wharfs, there are spiders. The most common species on the docks tends to be the (in)famous “dock spiders”. I am pretty sure that dock spiders are the largest spiders in Canada (if not, please correct me!). I receive many phone calls and e-mails about dock spiders, and I suspect an impressive amount of arachnophobia can be blamed on this hairy wonder of the Arachnid world. Dock spider (Family Pisauridae), Dolomedes sp. Dock spiders belong to the family Pisauridae, which are closely related to wolf spiders (family Lycosidae). Both of these families of spiders show interesting behaviours towards their young (‘spiderlings’). Females lay eggs within a silken egg sac, and this sac is carried around by the female until it is time for the young to hatch. Wolf spiders attach their egg sacs to the end of their abdomen, and when the spiderlings hatch they are carried around on the mother’s abdomen before embarking on a solitary life. Pisaurid females, however, hold the egg sacs by their fangs, and it is carried underneath the female’s body – it looks like the females are carrying around a big wad of cotton by their mouths. Pisaurids are commonly known as nursery-web spiders, as females build a silken, tent-like ‘nursery’ for their spiderlings. Upon hatching, the young spiders live in a protected place, typically spun in and among grasses, low-growing vegetation, or between rocks around the margins of water. Two species, Dolomedes tenebrosus and Dolomedes scriptus are the common ‘dock spiders’. Unfortunately it is difficult to tell these two species apart, without a microscope, forceps, and expertise. Both species are brownish-grey in colour, with black and light brown markings (‘chevrons’) on their abdomen. These spiders, especially the full-grown females, are the largest (native) spider species in Canada, and their body (including legs) can almost fill your palm – the body length (i.e., not including legs) of mature females can easily exceed 2 cm. But do not worry! 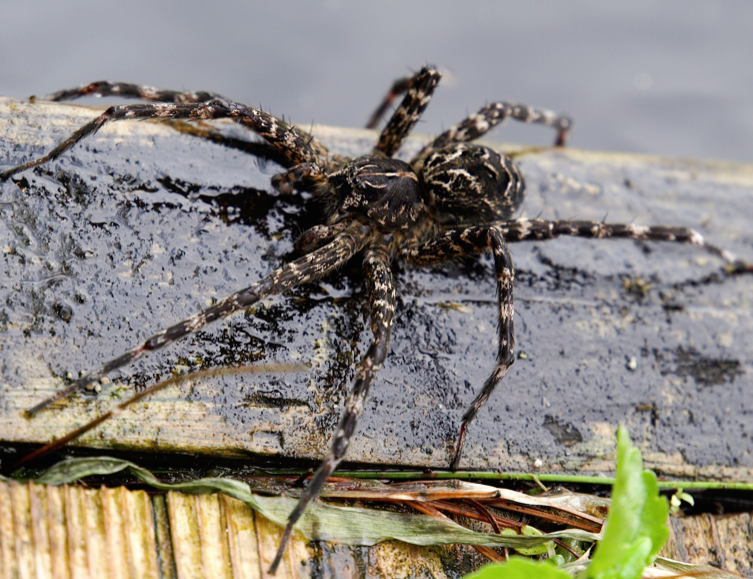 These spiders do not bite people, and would rather eat land-dwelling and aquatic insects, and they are known to catch small minnows, which is the reason for their other common name, the fishing spider. The spider will wait with its front legs resting in the water, and when small tadpoles or fish come near, the vibrations alert the spider to its lunch. An invertebrate eating a vertebrate is not a common occurrence in the animal kingdom! Dock spiders, as their name suggests, tend to be associated with the margins of lakes, ponds, swamps and rivers, where they typically sit motionless on tree trunks, rocks, boats, and docks. However, individuals are known to travel some distance from water, and are the reason for many alarmed people describing hairy monsters in their basements. This mainly occurs in the autumn months when the spiders are searching for a warm place to spend the winter (under stones, leaves, or bark, or inside buildings). After spending a winter as an immature spider, dock spiders typically mature and mate in the spring, with females carrying egg sacs for a few weeks, before the young hatch in the nursery. Females can then go on to produce a second, or sometimes a third egg sac before the end of cottage season. One egg sac can produce over 1,000 spiderlings. Without a doubt, dock spiders are impressive animals and although not small and obscure, they are still worthy of study. They should be considered friends of cottagers, boaters and home-owners. I encourage you to watch them, observe their behaviours, and marvel at their size – it’s especially fun to do this when sitting down at the dock, having a glass of your favourite beverage, watching when the evening comes…. Great photos, but one suggestion: When the size of the organism is important, it’s helpful to add something for scale, like a coin. Thanks for the comments! I totally agree that something for scale in the photos would be most useful- however, these species tend to be rather skittish and I have yet to photograph one with something relevant for scale in the shot- but I will keep trying. Maybe I’m not thinking of the same spider. I was trying to track down the extremely territorial Fisher spider in the lakes around Muskoa which do indeed bite, no attack people. They’re the size of your palm and can run on water. I have personally seen them attack people. Leaving double hand sized red welts from their bites. Is this not the same spider? Sorry, I call urban legend on that one! No spiders in Canada “attack” people. Fact. Some spiders will bite defensively, but that is all. And none leave welts as you describe unless the accidental “bitee” has an allergy to the venom proteins. How big would it be, let’s say, relative to the sole of my shoe? great story! Thanks for sharing. Glad you toasted the spider’s health – hope s(he) is still alive! Chris, pay attention here. 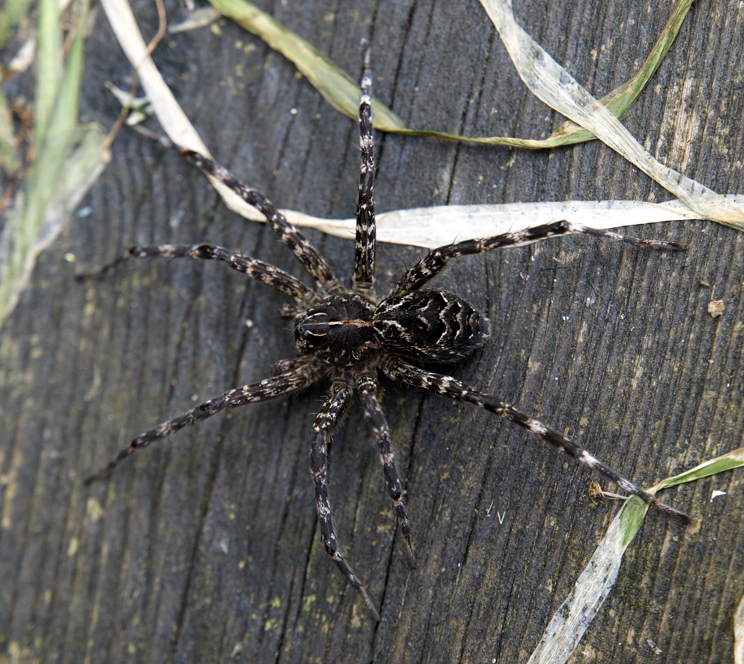 A “dock spider” is more properly termed a “wharf spider”. As my father instilled in us, a dock is where the boat parks, a wharf is the physical stucture which of course is the wharf spider’s preferred habitat. I fear I am fighting a losing battle. A freind of mine showed me a picture of 1 of those dock spiders during an exercise at CFB Petawawa (in the Ottawa Valley). The spider was so big that it stretch from the wheel well to the bed cap (cover on the bed of a pickup truck) of a Chevy Silverado. The spider fits the descriptions that I have read so far, including the size. It amazes me that these amazing creatures exist in Ontario yet the schools don’t teach the kids about these things. We have a camp in Restoule, Ontario. We have huge “dock spiders”. This past summer we had them dropping down from the ceiling of our gazebow, onto the table. Man they are so big and scarry looking. We also have them in the out house. I just hate going out there and seeing them. They give me the creeps. Until this year I really hadn’t seen them dropping. We know they won’t hurt us but they are soooo big and hairy. We had one on the hearth with a sack of eggs. It was probably about 81/2 cm including it’s legs. Yes, I have spent a lot of time on Ston(e)y Lake, and see this species there, often! i comented just now. but i need help with these spiders… there is so so many i live in some fear and lose lots of sleep! so i have LOTS in my bacement apt.. what do i do? how do i handle them around my child and pet. I have seen them trying to attact my dog! Chris, I have now found dead ones in my bed after waking up in the morning! Im actully highly considering moving out of my apt. How do you suggest i get rid of them before they get rid of me ?! Don’t worry, Ashley – they are not after you! There are lots of spiders in our houses, all the time – moving somewhere else will not solve the problem. If they bother you, vacuum them up regularly. I was bitten by a dock spider and became extremely ill. Others have been bitten as well. Search dock spider bite. I am well aware of the many, many stories of spider bites out there on the internet. However, I would argue that in the vast majority of cases, actual spider bites (by any spider! including dock spiders) are uncommon. What is common is that people implicate spiders all the time, without real evidence that a spider actually bit them. It’s easy to blame the spider, but in many cases other, more likely causes are to blame. I can also provide many anecdotes about spiders – in my case, I have handled hundreds (thousands?) of spiders over almost 20 years; I have studied them, collected them, reared them, and have never been bitten. I spend summers at cottages, on wharfs, in and near ponds, and have never been bitten by dock spiders. They run from humans. I’m currently looking at two of them. One is a it larger than the other and the smaller one is darker…the other more grayish. Interesting looking creatures. I don’t doubt that spider bites are much rarer than people think, but saying “These spiders do not bite people” isn’t true. Saying “These spiders rarely bite people” would be a more accurate statement. I know you’re trying to reduce unnecessary arachnophobia, but I don’t think exagerrating in the other direction is the correct course of action. Thanks for the comment, Jason: You are correct! I am purposefully wording it this way to try to reduce fear of spiders. I would argue that at least in northern North America, there is little risk of exaggerating in that direction – spider bites are really, really rare. last nite we had company overnight at the cottage in Northern Ontario. My friend was sitting on the sofa when one of the largest wharf spiders I have ever seen crawled up behind her and disappeared. They give me the creeps and I want them out of my cabin! “Dock” and “wharf” are technically interchangeable. Anyway, being Canada, “quay” would be more correct. As always in English, the majority rules, so “dock” it is. I had one staring up at me from the bottom of my kayak while out on the water – I screamed and was trying to balance on the back of my kayak while I paddled? to shore! It must have been a funny sight! This was in Petawawa – grew up with lots around but they still freak me out!!!!!!!! My dad was bit in the foot by a dock spider when he was in bed and I was bit on the top of my foot once in my boat when I was wearing sandles. The one that bit me was not scared of me that’s for sure. He was about 5 feet away from me and ran at me when I startled him grabbing my fishing rod. They are very fast and it hurts a lot when you get bit. Also major swelling. couldn’t wear a shoe for about 4 days. I have a fairly large Wharf spider, I caught it on thanksgiving and its body is about 26mm(larger than a loonie and smaller than a toonie), and when it’s legs are fully extended it’s about 80mm give or take. I have also seen larger wolfspiders, and a very large black spider that I couldn’t identifiy. The wharf spider was in a barrel near our cabin, I suspect the ones that stay closer to water don’t get as big likely because of birds. We have been feeding it crickets and a few other bugs which it seems to enjoy. I find it has been a great exercise for my kids. They much less afraid of standard size spiders and are getting used to seeing her sun bathing in the window, enjoying a cricket, or walking over to the edge of the container to watch me do the dishes. We are all getting over this irrational fear, I would rather have them around than mousquitos(west nile), ants(infestation, wood damage), earwigs, and silverfish. etc. Since i had a dock spider jump on my face on bonnet lake in mainitoba i have not found one to be as big since. we caught the spider in a large coffee tin. it could not spread its legs completely open. i was asked to rebuild a dock for a gent and when i laid down on my belly and looked underneith this spider jumped onto my face and latched on. out of fear i slapped it to get it off my face but it clung on till i slapped it strait on. it then jumped off. we managed to catch it in a large coffee can but the spider was bigger than the can………Moral of the story…….. dont stick your head under a dock in Manitoba. Oh my gosh. That is terrifying!! So how much of your face did it cover while latched on? How did you manage to catch it in the can? Didn’t it run away after you slapped it off? My brother was also bitten by a large dock spider in the whiteshell. He was standing at the end of a dock, fishing, when a large dock spder jumped off the water, bit him on the lip and jumped off before he could react. he said it didnt hurt but his lip swelled up substantially. This event did not detur him from fishing off docks. with water comes water spiders. I had the impression that dock spiders were non aggressive or at least too afraid of us to do something like this. Jumped off the water onto his face!? That is a huge jump! My arachnophobia is because my brother got bit by a brown recluse and it is so bad I could scream at a black-and-white(as in colorless, not a black and white spider) image of a spider on a piece of paper. If your brother lives in Canada, he did NOT get bitten by a brown recluse. Period. Sorry but you’re wrong. I know a few people who had it confirmed they were bitten by a brown recluse. Period. Thanks, Dave, for the comment. I know Stony Lake VERY well! There are some very impressive dock spiders in that part of Ontario. Glad you enjoyed the post -sorry your kids won’t agree. Thank you for the great blog. I have arachnophobia but wish so desperately to be free of this fear. I sometimes go on the web (no pun intended) and look up spiders to learn more or just to freak myself out I think! Last night I came across a palm-sized spider that may have been a dock spider though I’m far far away from any water. I am less afraid now but more work to do! This page helped me while I stared at a big female (in tears lol) coming out of a hole in the floor in my new house…since then (3 weeks ago) I have found 3 more females (Haven’t seen any with egg sacks yet) and many males in the house, always coming out of holes and cracks in this old house during the day, any insight on why they would be living in a home? Is there something I could do to make this place less desirable without hurting them? I would rather not give room and board to another generation. the closest pond is a decent walk away in the back of a 50 acre property. I have been catching and releasing them away from the house which has been difficult as I am terribly afraid of spiders, I do have an appreciation for them though they are quite pretty after all. This my seem silly but I have baby ducks in the house and although I cant imagine the spiders would attack one of the ducklings but the duckies are curious and nibble everything, if one did happen to get bit could it be fatal? they are only a week old, I know their venom isn’t strong enough to hurt us but the duckies are so small. Hello – thanks for your comment – I honestly don’t know if dock spiders could (or would) bite baby ducks – I suspect not. Chris, is it typical for dock spiders to live in a home like this? It does not seem to fit the profile as I understand it! I first came into contact with this species in 1999. My wife and I went down to the dock of the boat house at my cousins cottage. His cottage was in the Kippawa Quebec area. I was forewarned so I kept an eye out for them, and there she was, sitting on top of a 4in x 4in post. The spiders legs covered the entire top of the post and then some. I hustled my wife back toward the cottage, knowing with her fear of spiders she probably would have had a break down of some sort. I am at our cottage on Lake Louisa in Quebec, north of Montreal. Just before dinner I sauntered down the 76 twisted steps with my towel in hand to go for a dip in the lake. I’ve seen some big spiders but I have NEVER seen a spider as freaking colossal as the one that was waiting for me on our wooden deck/dock/wharf(oh, who cares?). I let out a scream and bellowed, “holy snapping crap!”, which I’m sure echoed throughout the lake area. Then I galloped up those 76 stairs, barely touching them. That…..thing(!) was scary. Did I mention I’m petrified of spiders? I wish you had gotten a picture! Yikes! Thanks for the comment – in canada, I suggest you start with the Entomological Society of Canada, and on their website they have links to regional societies, too. Indeed, I don’t know of any Arachnological societies in Canada – although the American Arachnol, society is excellent. Thanks for this interesting and informative website, Chris! I’m an arachnophiliac from ‘way back (cottage on Chemong, Grampa’s cabin in Oklahoma). Don’t remember ever being anything other than fascinated by spiders. I think the irrational fear is cultural, not instinctive. Currently watching a spiderling near our sink in the kitchen. Common house spider. S/he just got a fly yesterday! I’m so proud of her (or him). When she gets older I’ll move her into a more appropriate location (front hall?). I had a spider about the size of my palm on my chest today while sitting at home. Not sure what kind it was, I am at least a kilometre north of the lake. We have lots of vary common house spiders in our house (lots) and I regularly get little bites. Have to admit seeing this guy on my cleavage made me scream and jump and not much alarms me. Not sure where he went. Nor what kind he was. Haven’t seen one that large before in a house. Reminded me of the huge spiders the UK have for house spiders. I had just come back from the grocery store so perhaps he hitched a ride. I am hoping the dog ate him when I flung him. Sleeping with Jammie’s on tonight that is for sure. Gave me the creepy crawlies since it was on me while I was sitting in my bed! Worst place to find a big fuzzy spider! Any idea what the heck he is? We had smaller spiders at our cottage on kaminskeg that bit and left a welt. Only one summer by the waters edge on the wood stools. This guy was much bigger.